Indonesian ride-hailing firm Go-Jek on Wednesday (Sep 12) launched its services in Vietnam’s capital of Hanoi under the brand Go-Viet, as part of its US$500-million international expansion. Higher tariffs for Vietnam’s wind power projects will make investments more commercially viable, experts say. Vietnam gained nearly 5.6 billion U.S. dollars from exporting wood and wood-based products in the first eight months of this year, up 13.3 percent year-on-year, the Wood and Forest Products Association of Vietnam said on Wednesday. Vietcombank has decided to pay shareholders a cash dividend at a rate of 8 per cent after last year’s business results. The US government lowered the anti-dumping duty on frozen warm water shrimp from Viet Nam. A 75 kWp solar power installation to inject more than 50kW clean power into ABB’s High Voltage and Distribution Solutions factory in BacNinh province. Vietnam’s stock market capitalisation increased 13 percent against the end of last year, reaching nearly 3.97 quadrillion VND (169.5 billion USD) by the end of August. While Vietnam has huge potential for e-commerce development, the country’s infrastructure for the industry still lacks synchronization and connectivity. Emerging economies have accounted for almost two-thirds of the world’s GDP growth and more than half of new consumption over the past 15 years yet, as individual countries, their economic performance varies substantially. Technology, and start-ups in particular, hold the greatest promise for Vietnam, according to VinaCapital`s CEO. Vietnam could potentially benefit from the escalating China-U.S. trade war even as Washington continues to threaten Beijing with more tariffs, according to one investor. On Tuesday, Hanoi officials urged residents to ease off eating dog meat, saying the popular dish is tarnishing the city’s image and risks spreading rabies. Vietnam should be more flexible in handling its exchange rate, and is on track to cut its public debt to about 60 percent of gross domestic product by 2020, its finance minister said in an interview on Wednesday. The store, named eDiGi, is the first authorised store to meet the standards of both Apple Premium Reseller (APR) and Apple Service Provider (ASP) in Viet Nam. New vehicle sales in Vietnam fell by 7.4% to 19,213 units in August from already weak year earlier sales of 20,746 units, according to member data released by the Vietnam Automotive Manufacturers Association (VAMA). The seventh international power generation, transmission, distribution and renewable energy exhibition (Electric & Power Vietnam) 2018 kicked off in Ho Chi Minh City on September 12, with the participation of more than 180 firms from 22 countries and territories worldwide. New trade and investment opportunities in Vietnam were introduced to Canadian officials and businesses at a seminar in Ottawa on September 11. Soon after the National Assembly passed the Law on Foreign Investment in Việt Nam in 1987, the country started witnessing Foreign Direct Investment inflows which have made considerable contributions to the national economy. The Vietnam War, the 10-part, 18-hour documentary film series directed by Ken Burns and Lynn Novick, is available for WITF Passport members. Watch the series on WITF.org and PBS apps for iOS, Android, Roku, Apple TV, Amazon Fire TV and Chromecast. .
Prime Minister Nguyen Xuan Phuc asked Danish beer maker Carlsberg to expand its investment in Vietnam during a reception in Hanoi on September 12 for Carlsberg CEO Cees‘t Hart. Australian miner Rio Tinto’s first cargo of iron ore sold to Vietnam’s Hoa Phat Dung Quat Steel Joint Stock Company in June was expected to load in the second half of September, a Dung Quat Steel source said Wednesday. Chairman of the People’s Committee of Thai Nguyen province, Vu Hong Bac, and Chairman of the Board of Directors and CEO of T&T Group, Do Quang Hien, signed a memorandum of understanding (MoU) on the investment in five projects worth a total of VND46 trillion (US$1.97 billion) in the province. Vietnam’s acting minister of information and communications, Nguyễn Mạnh Hùng, said today that Vietnam, as an emerging economy, would be able to take advantage of the fourth industrial revolution, even though the country missed the first three. Accelerating the development of the private sector and expanding domestic private finance are key priorities for Viet Nam to meet the financial requirements of the Sustainable Development Goals (SDGs), a United Nations Development Programme (UNDP) report launched yesterday reveals. The World Economic Forum on ASEAN (WEF ASEAN) 2018 is taking place in Hanoi from September 11 to 13, featuring about 60 discussions and gathering the attendance of approximately 1,000 domestic and international delegates, including the senior leaders of the ASEAN member countries and many leading economic groups from around the world. Ha Noi FC have been crowned champions of V.League 1 with five games to spare after claiming an unassailable 16-point lead following Sunday’s 2-0 triumph over Song Lam Nghe An. In the near future Vietnam will continue facilitating the equitisation of large State-owned enterprises (SOEs), which offers a great opportunity for Japanese companies to make long-term investment in areas with great potential for development in the country. South Korea and Vietnam have had valuable experiences in cooperation in many fields, especially science and technology cooperation with a view to serving the socio-economic development. 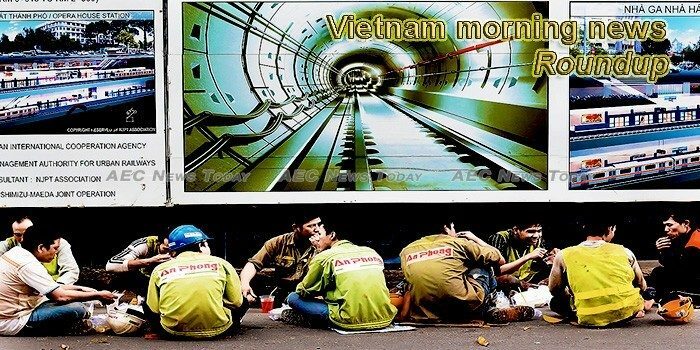 The Directorate for Roads of Việt Nam, in one month, collected fines totalling nearly VNĐ18 billion (US$773,000) for traffic violations, reported online newspaper baotintuc.vn. Demand for Vietnamese-made lanterns for the upcoming Mid-Autumn Festival has increased sharply from previous years. The Chisago County History Center in Lindstrom currently has an exhibit commemorating the 50th anniversary of the end of the Vietnam War with a unique display of photos, model airplanes, and other artifacts from the time period. In May, a month before the Trump administration proposed a 25 percent tariff on China-made e-bikes, Pedego co-founder and CEO Don DiCostanzo went to Vietnam to look for factories to make e-bikes.